Family Nurse Practitioner: one year recent clinical experience. Adult-Gerontology Acute Care Nurse Practitioner, Nursing Administration and Nursing Education: two years recent clinical experience. 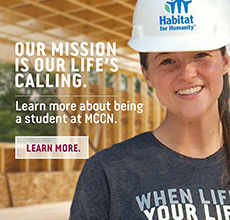 Student has met all admission criteria for the MCCN master's program. In consideration of the Mission of Mount Carmel College of Nursing and Mount Carmel Health System, students who have an undergraduate grade point average (GPA) of 2.75 to 2.99 may be awarded a provisional non-matriculating admission status if seats are available in the Nursing Administration and Nursing Education degree programs. These students will take four courses in their first two semesters and need to earn above a 3.0 GPA to have the provisional non-matriculating status changed to a full admission status. If a GPA of 3.0 is not achieved the student will be dismissed from the College. In addition, in circumstances where the academic achievement (GPA) in the undergraduate student years is not stellar and less than a 2.75 due to unexpected and extenuating life situations, but the nurse has achieved leadership within his/her career and has demonstrated scholarly activities indicative of high academic achievement, a provisional non-matriculating admission status may be awarded.